On a nice early autumn day in 2003 I stopped by a second-hand camera shop in Budapest and had a casual look at the display in the shop window. (This later turned out to be an act with far reaching consequences.) Among the various old cameras and other photographic curiosities I saw a pretty little thing; blue in color and with features that - to me at the time - looked unusual and interesting. I ended up buying that nice little FED and with it my hobby of collecting, using and fixing various kinds of film cameras began. In case you are contemplating buying an inexpensive, yet highly capable and delightfully nice-to-handle, rangefinder camera I suggest checking out the FED-2. I have put together a raft of information under the following topics to help you get acquainted with the camera. There is not much to a FED-2; it is a simple machine with few controls. Just enough to take good photographs. Nothing less, nothing more. Lacking any automation, the photographer needs to know a thing or two about the techniques of photography; selecting the aperture and shutter speed appropriate to the subject, judging the correct exposure, and so on. Film advance, as well as, film rewind is performed by turning a knob. This is not very fast, but speed comes with practice. The range of shutter speeds (1/30 sec. to 1/500 sec. plus B) is adequate in most picture taking situations. (Note: shutter speed markings on older FEDs follow the older sequence; see version differences.) The shutter is relatively quiet (rubberized fabric shutter curtains and no slapping mirror) making this camera a good candidate for candid photography. A good variety of M39 mount (or LTM) lenses can be attached to the camera, including older Leica lenses. Focusing is, of course, manual and is carried out with the help of the rangefinder, which is more accurate than most thanks to the wide base. (Note: with rangefinders of this kind one can reliably focus lenses up to about 135 mm in focal length.) On the other hand, this camera is not well suited for close-up photography. About 1 meter is the closest you can go to your subject (without using a special accessory). Take off the back of the camera by first opening the two latches at the bottom and then sliding the back down a bit and lifting it up and away from the body. (To open the latches, you simply lift up the semicircular handle and give it a 180 degree turn.) Closing is the exact opposite of opening. You load the film by inserting the cartridge on the left. Unlike in a typical SLR, the fork cannot be pulled up (and it does not have to be). You can pull out the rewind knob some way, but it only makes rewinding more comfortable. It does not pull up the fork, so don't try to force it. Oh yes, and I should mention, that you do have to use the take-up spool that comes with the camera. You can't substitute it with one of those plastic ones that are found in modern film cartridges. So when you buy a FED-2, make sure it comes with its original metal take-up spool. Just one more thing: it is always a good idea to take a glance at the rewind knob when you advance the film to the first few frames to see that it has been properly loaded. The rewind knob should turn counter-clockwise as you move to the next frame. As many other users will tell you, this has to be done in this very order; advance the film by turning the film advance knob as far as you can (with this you also wind up the shutter), and only then set the shutter speed. You do that by pulling the shutter speed setting dial up a little and turning it so that the required number aligns with the little dot in the middle. When properly aligned, the dial should click into position. Warning: do not go from B to 500 or vice versa. If you are at the highest speed and want to select B, turn the dial around over all the lower speeds. It is not possible to expose the same frame more than once with this camera (either accidentally or on purpose). There are no complications here, this is 100% manual. You can set the aperture any time you like. You won't be looking through the lens, there is no internal light meter to worry about, so your adjustments will not interfere with anything. First of all, make sure you get a sharp view in the view/rangefinder. If the view is blurred, try to move the diopter adjustment lever (next to the rewind knob) forward or backward. It will make a difference! FED-s have an orange (or golden) spot with a split image in the middle of the viewfinder. Your goal, of course, is to bring the two images (one is noticeably dimmer) into perfect overlap by turning the distance scale ring on the lens. This is not always easy when the light conditions are poor. Try to find vertical lines with high contrast. The FED-2 has a large rangefinder base length (i.e. the two windows of the rangefinder you see in the front are relatively far apart), which makes setting the distance accurate even with moderate telephoto (135 mm) lenses. Also, unlike in a Contax (or Kiev), the position of the windows is such that there is no danger of your fingers blocking them as you hold the camera for shooting. If there is no way you can make the two images overlap, your camera is misaligned and needs to be fixed. You will notice that the speed selector dial rotates as you press the shutter release button. Not that there is a real danger of it with this camera, but don't put a finger too close to the speed selector dial, because you might impede its movement. Wind back the film with the rewind button, open the back cover to take out the film and rush to the nearest photo outlet (or better still, develop the film on your own). One great thing about the FED-2, is that you can use lenses of different focal lengths with it. Typical are the 35 mm, 85 mm, and 135 mm Jupiter lenses, apart from the 50 mm standard lens. The lens mount is a 39 mm screw type (as per Leica). You turn the lens counter clockwise to take it out. When you put it back, it is a good idea to first set the distance to the shortest (1 m on the standard lens), otherwise the rangefinder coupling arm gets in the way and makes it harder to match the start of the thread on the lens and body. If you have looked at a few FED-s already you probably have noticed that the position of the lens markings are all over the place in relation to the body. In other words, some lenses screw in more, others less. Don't worry about this, this is just the way they are. However, if you are getting unsharp pictures, and there is no other common explanation for it, then the distance between lens and film may be suspect. Often paper shims were installed in the factory under the mounting ring to fine tune the focus and these may have been tempered with by an amateur 'repairman'. The forerunner of the FED-2 was, as you might have guessed, the FED-1. (However, it only had FED written on it, without the 1.) The FED-1 in turn was modeled after the Leica II d.
The Russians did purchase the license for manufacturing these cameras in 1932. In addition to the camera body, the license included the f/3.5 50mm Elmar lens and the re-loadable Leica film cassette. The FED-1 was manufactured from 1934 to 1955. In the last three years the lens received an anti-reflexive coating. The story of the first manufacturing plant and the FED mnemonic is hugely interesting. 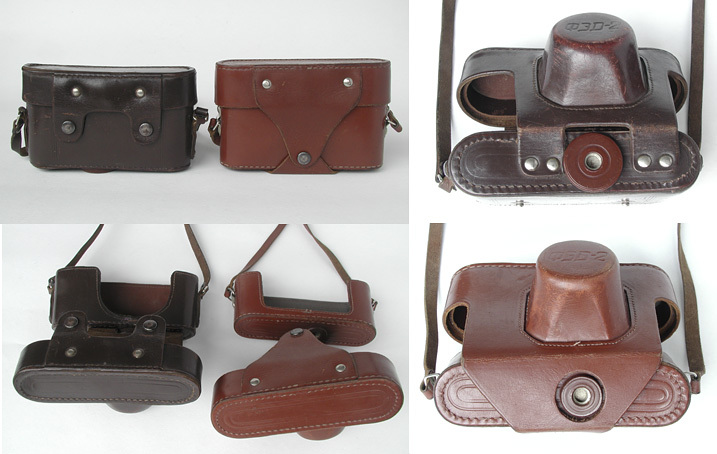 The FED-2 first appeared in 1955 and lasted until 1970, or thereabouts. It went through a few variations, improvements, such as the addition of a self-timer in 1957. However, the most prominent new feature, that also set it apart from the Leica, was there right from the start. Namely, the combined view- and rangefinder with a large (67 mm) base distance. This got shorter again in later models. In addition, the Russian engineers replaced the removable bottom with a removable camera back making the loading of the film a lot easier. Unlike the earlier FEDs, the FED-2 can be successfully used with lenses other than the one it was sold with. This is due to the now standard 28.8 mm body depth. The lenses of very early FEDs had to be specifically adjusted to the body they were put on. From 1957 the collapsible lens was replaced by a larger and faster f/2.8 standard lens of Tessar type marked Industar 26M. This is the most common lens FED-2s are found with nowadays. I am sitting on the lounge with a number of cameras laid out in front of me on the coffee table. They are all FED-2 cameras, yet they don't look the same. On some, the differences are hardly noticeable, while on others they are more evident. Interestingly, there is no obvious progression from one type to another - the alternative features occur in various combinations. Having said that, one can still - with some effort - distinguish two basic versions; an 'old' and a 'new'. This classification is somewhat arbitrary and is based on three things: the design of the film advance knob, the presence or lack of a self timer, and the shutter speed values. In the following I will point out the features that may vary from one instance of a FED-2 to another. Since I base my presentation on only a small number of cameras, it is quite possible that other variations also exist. I'd love to hear from you, if you have a FED-2 camera with some peculiarity that I did not mention here. The film advance knob is larger and includes a film type reminder dial on the newer FED-2 cameras. It seems that the older FED-2 cameras were built without a self timer. Also note, that where there is a self timer, the flash connector socket has been moved to a new position. Some cameras are found with the older shutter speed number sequence (B, 25, 50, 100, 250, 500), while others come with the numbers commonly used today (B, 30, 60, 125, 250, 500). 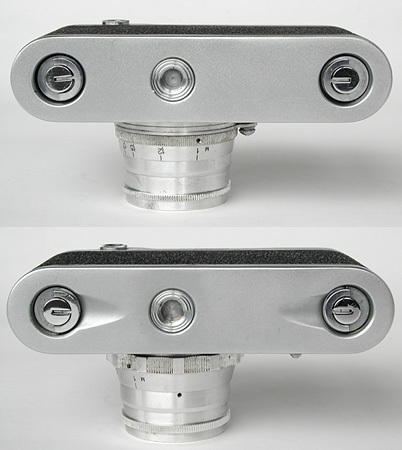 The bottom plate is either entirely flat, or it may have recesses near the latches. The square viewfinder window in front might or might not have a raised frame around it. 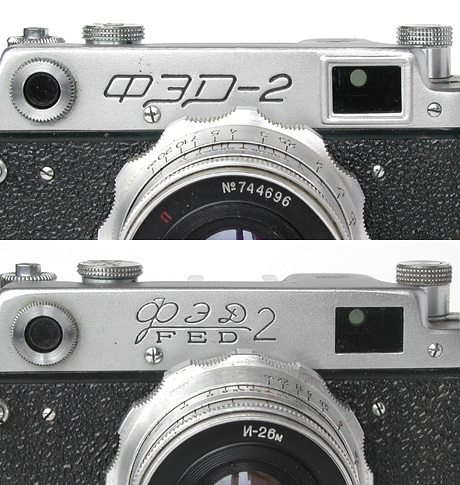 The engraved FED-2 logo is either in large Russian characters, or in both Russian and western type. There are two types of hard leather ever-ready cases I have come across. One of them is typically darker brown and looks as if it preceded the other, which has a more modern cut and accommodates the self-timer, apart from displaying other feature differences. Although this is not a property of the camera as such, but it is worth mentioning that FED-2 cameras usually occur with two very slightly different Industar standard lenses. Only the distance setting rings are dissimilar. Roland FP-30 'secrets'; playing GS instruments on the Roland FP-30 digital piano.